Leading graphics supplier, SAPPHIRE Technology is now introducing a broader range of PC power supplies aimed at providing the very best specification of PSU for the PC builder, gamer and PC enthusiast at affordable prices. Users of high end computers with expensive CPUs and using the latest motherboards and graphics solutions, including multiple GPU cards or multi-card setups, need a well designed PSU with well regulated outputs to ensure stable and reliable operation. Some power supplies with daisy chained outputs or multiple outputs from the same rail cannot offer the stability of supply to be sure of avoiding potentially expensive failure or the occurrence of frustrating PSU-related computer problems that are difficult to diagnose. SAPPHIRE’s new power supply range carries the established PURE brand of its motherboard series, and offers a choice of power ratings. Top of the range is the PURE 1250W, designed for the real ‘power user’ and rated at 80Plus Bronze level. 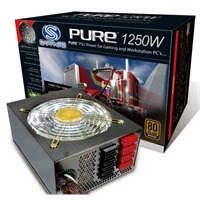 Next is the PURE 1050W, which delivers enough power for most multi-card users and has 80Plus Silver certification. These two products are the real enthusiast products with power in hand for even the most advanced rigs. Another new introduction, demonstrating SAPPHIRE’s recognition that value for money is critical in today’s economic climate is the PURE 950W. Delivering over one Kilowatt of peak power, and with certification to the 80Plus Silver level, the SAPPHIRE PURE 950W is positioned at a price level to compete with supplies that have much lower specifications. For the mainstream user, SAPPHIRE’s award winning 625W workstation PSU now joins the new introductions as the PURE 625W. This unit is conservatively rated at 625Watts and is also 80Plus certified. It is more than capable of powering a typical PC or graphics workstation even with multiple graphics cards. SAPPHIRE PURE PSUs are future proofed with a modular cable system which includes the new ATX V2.3 12-pin connector block scheme supporting not just current but also future CPU and graphics requirements. Current PCI-Express graphics are supported by two cables with two 6+2 Pin (8 Pin) connectors each, not daisy chained but split chained. This makes for less cable clutter than having four cables each with one connector, but is superior to daisy chained solutions and allows, for example, two dual graphics cards easily to be connected. Barbed connectors reduce the risk of accidental disconnection. Amongst the many features of the SAPPHIRE PURE PSU design is the use of aluminium capacitors to ensure power stability and reliability. SAPPHIRE PURE PSUs support Active PFC which improves the power factor up to 0.99, has greatly reduced AC harmonic distortion and saves energy. A specially designed 12 cm air intake reduces noise and maximizes heat dissipation, allowing optimal cooling to be achieved with the quiet, white LED lit, 13.5cm ball-bearing fan with speed control (450 – 2000 RPM). 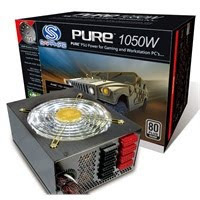 SAPPHIRE PURE PSUs are conservatively rated and, unlike competing products, will deliver full power over the unusually wide operating temperature range of 0-50 degrees Centigrade. All SAPPHIRE PURE PSU’s are fully tested and certified to be compliant with CE, CB, UL, CCC, FCC, TUV, and RoHs standards. They are designed for global operation, working automatically from line voltages from 100-240V AC. They feature extensive safety protection, including protection against Over Loading, Current and Voltage Protection, Under Voltage Protection and Over Temperature Protection as well as Short Circuit Protection. They are also EMC safety certificated which means full-scale electromagnetic filtering protects the system against radiation interference.